Organize your bookmarks/favorites and shortcuts simply, quickly and reliably with this bookmark manager: search, sort, check, encrypt, import, export, backup & print any number of bookmarks; keep notes; and manage your logins. Handles multiple and very large collections of bookmarks, which can also be shared. Compatible with all Web browsers, with import support for Internet Explorer, Netscape/Mozilla, MSN, Opera, AOL and CompuServe. It's been some time since this great little program was reviewed here, so I thought I'd add my own tuppence worth. In a nutshell, this is one of those programs you fall in love with, one of those programs that make computing pleasant again. While Opera and Firefox (with plugins of course) have decent enough bookmark managers, this program adds a touch of refinement to the task of bookmarking. Add notes to your bookmarks, set a time for a bookmarked page to open (handy if you're watching a product on eBay for example), fill in your username and password to login fields automatically, launch programs, and more - it's really well worth the money in my view. Can you get away with the bookmarking facility in your browser? Sure. Are there free, open-source alternatives? Most likely. But this program adds such a nice touch to bookmarking I think it deserves a look. If you're a reader and you have a favourite bookmark for your books you'll know what I'm talking about. Some people are happy to stick an old envelope in their book to mark the page they were at last time they picked it up. That's fine, but if, like me, you appreciate the nice touches and the extra thought put into a bookmark, then give this program a go. It's the finer details that matter. Love this program, just wish development progressed faster. Registered user since 1999. This is the best program I have on my computer and I use it constantly. It is a must for anyone that does a lot of internet research and wants the easiest possible way to see and organize links. You can create unlimited folders, for every topic you want to track. As a webmaster, I easily store all the links I use for each site in its own folder. Adding links is effortless and you can alphabetize with a click. I've used it a long time and they have done several updates to expand and improve it. But from day one it was already a great asset. Forget IE Favorites - this is the way to go. I had been looking a long time for a program that could handle thousands of URL's in a simple and easy to use interface. I finally found what I was looking for with Bookmark Buddy. I wanted a program were I could quickly find the URL I wanted and had an organizational structure that was clear and easy to use. Its easy to find any URL you store -even months later when you've forgotten what the site was calle. 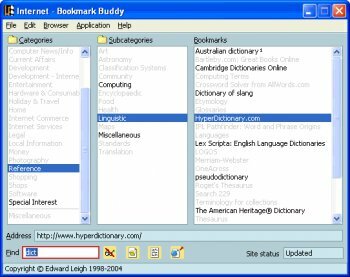 With bookmark buddy you can simply type in a few keywords or even just part of the URL and it will pull it up for you right away. You can make notes on each URL which I find an invaluable feature - and the search facility includes any words in the notes too! You also have a host of other time saving features too e.g auto login feature that remembers user name and passwords for web sites (encrypted), shortcut keys, can set reminders to visit a site again and automatic recording date time of last visit to site. There are also a host of other valuable features e.g. an export features to excel and a lot more that I haven't used yet. This program has saved me so much time, hassel and frustration that I really don't know how I would manage without it now. The other thing I like is that the developers of this program are constantly adding new features and improvements to this program. And all the updates are free. I can highly recommend this program as a great time saver and productivity tool. The best I ever used and I have used some, like check and get, linkstash and websitewatcher. The strength of BMB lies in its clear and clean interface and the easy way one can add a wealth of notes and remarks to each bookmark. Very fast searching and it works with myIE and FireFox too! Best bookmark program I have tried (and I tried a lot). Very much worth the price. For power users that need a little more than the default bookmark features in the browsers this is the program for you. This program has now been updated (to 3.0) and renamed (to Bookmark Buddy). The improvements in 3.0 are GREAT. The very best organizer there is. I was very unhappy with IE favorites. Mozilla has made no improvements either on the bookmarks. Try this, you won't regret it. Higly customizable. had to diss the first review. I've found this program to be one of the two best bookmark managers around. The other one is Powermarks. It's flexible - solid - useful - easy to drive. Shame to see a fine program getting unfairly reviewed.